I don’t know if it’s just that I’ve begun to notice them more, but it seems like there are many more cycling events taking place these days! The latest one to hit my radar is Orbital Cycling Festival, which takes place at Goodwood at the end of July. The weekend looks like a real blast if you’re into any kind of competitive cycling – there are all sorts of different races, from cyclocross to flying laps, the Brompton World Champs to time trials and even family races. 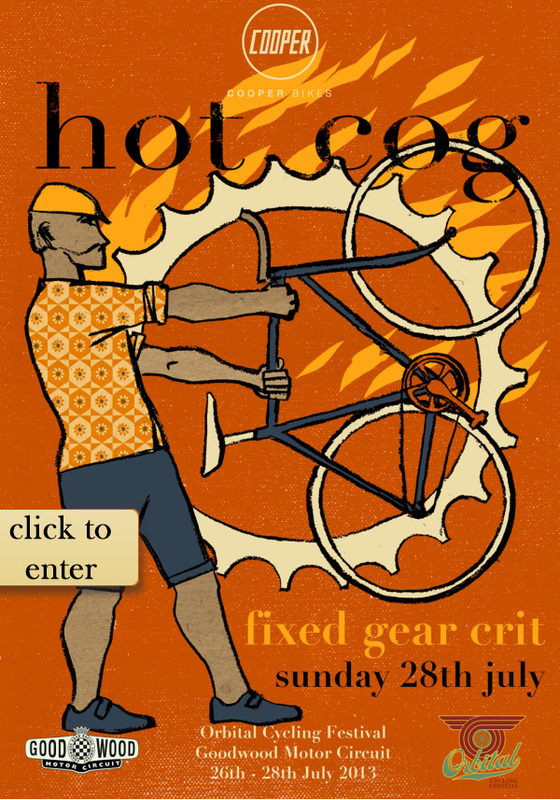 The one that caught my eye is the Cooper Bikes Hot Cog which is a fixed gear crit, or circuit race, similar to the one I entered at the Nocturne. The website specifically states that the races are for men AND women, so I’m assuming that means that even thought you’ll set off in the same bunch, the women will be ranked separately. It would be a welcome change were that the case; when I’ve entered alleycats in the past, there were always prizes for the fastest ladies. I’m hoping to see lots of my friends there, and I’m very much hoping a lot of other women will compete with me. Racing against super fast dudes can be a bit demoralising sometimes, so I’d relish the chance to be demoralised by the ladies instead!